When it comes to creating the bedroom of your dreams, there are a few elements that are essential. Think: Sumptuous linens, soothing hues, and lustrous lighting. Beyond simply illuminating your space, a decorative fixture can set the mood and complement your overall design scheme. 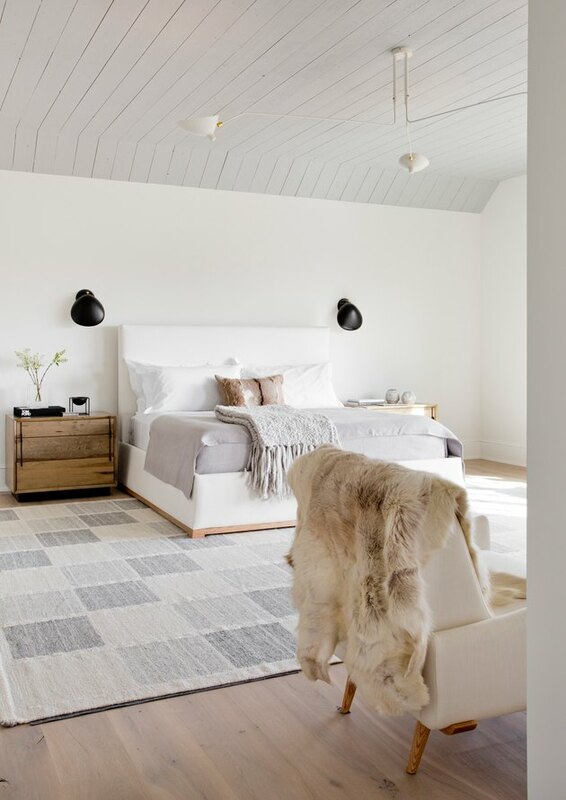 From sparkling chandeliers to contemporary pendants, here are 12 bright ceiling lighting ideas to up the wow-factor in your bedroom. With its sleek, balanced form, this West Elm chandelier is sure to bring a little midcentury flair into any boudoir. Complete the look with a modern walnut bed frame and trio of graphic prints. We're sweet on this pretty in pink space. The finishing touch? An ultra-feminine, floral burst chandelier that descends from the center of the pale pink ceiling. 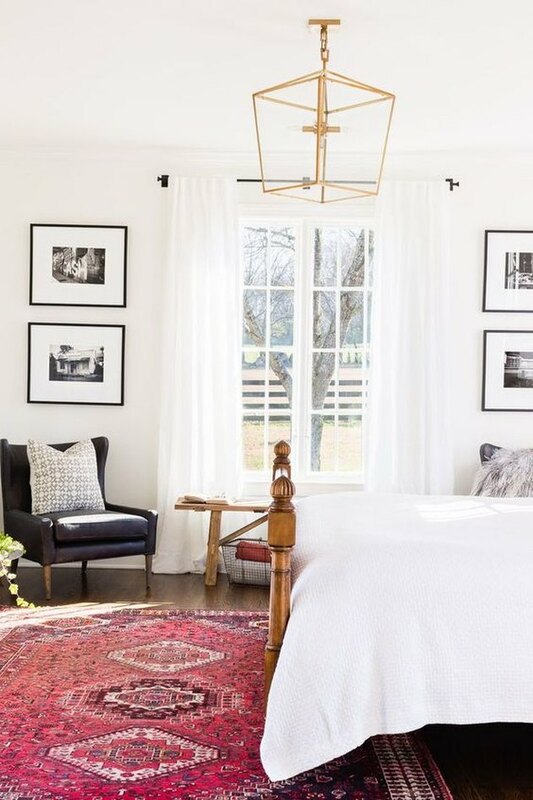 A suspended antique gold chandelier (like this Mill & Mason option) exudes elegance and warmth, while keeping your nightstand free for decorative flourishes. 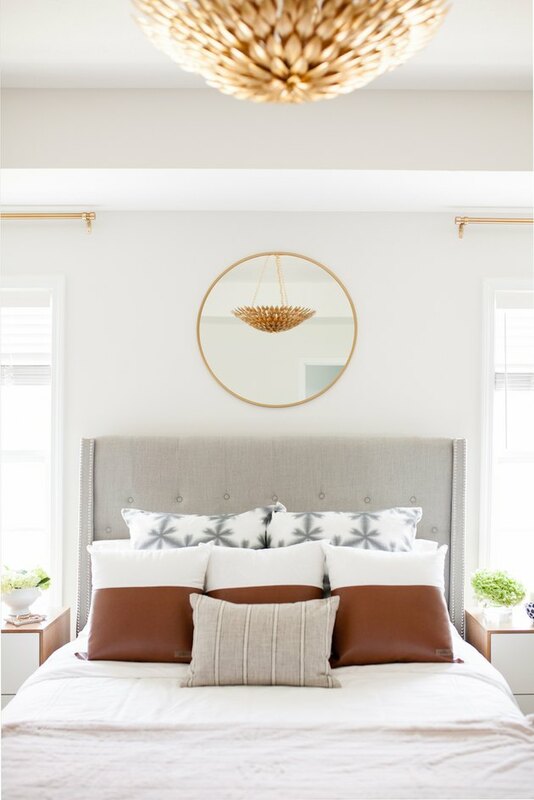 Designer Ashley Cooper paired her lovely ceiling fixture with coordinating gold drapery hardware, a round gold frame mirror, and warm accent pillows on the bed. The effect is rather striking. This cozy yet masculine sanctuary by CC + Mike is downright dreamy! Gorgeous from every angle, this glass and iron cage lantern exudes an old-world charm that we just adore. A canopy bed, luxe pale-blue area rug, and upholstered bed bench round out the room. 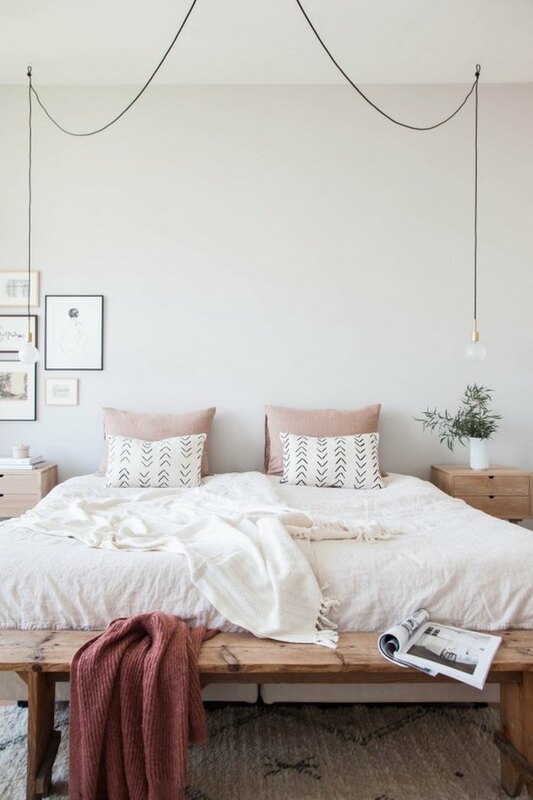 White walls, clean white bedding, and lots of natural light produce the perfect soothing backdrop, that's tailor-made for a bit of showing off. A beautifully modern take on an old-school lantern, this gold frame fixture adds a shimmering metallic edge that pulls the entire room together in one lovely package. The perfect complement to any interior, these lovely drop pendants steal the show. The black cord, opal lightbulb, and gold finish socket are draped across the ceiling in dramatic fashion. Check out these pendants on Etsy for a similar look. Minimalism, meet boho style. 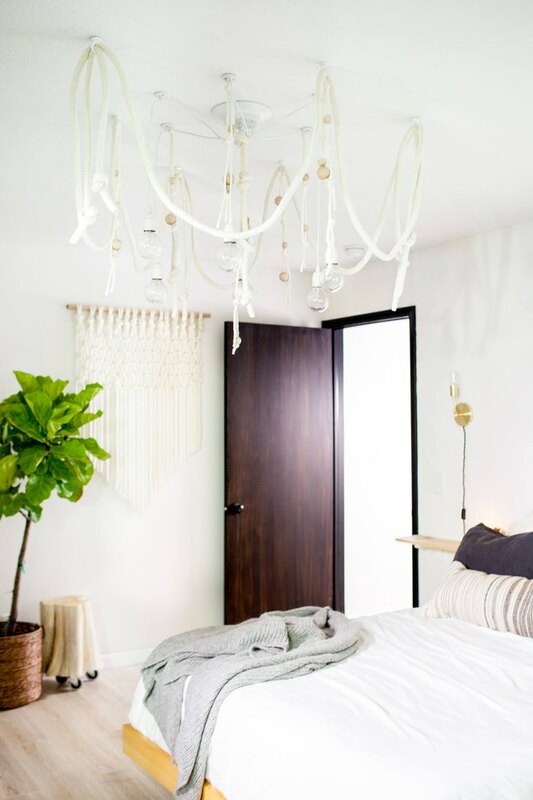 This whimsical macrame light installation evokes an easygoing Palm Springs feel. Although this stunner is a DIY, but you can snag a similar piece on Etsy. 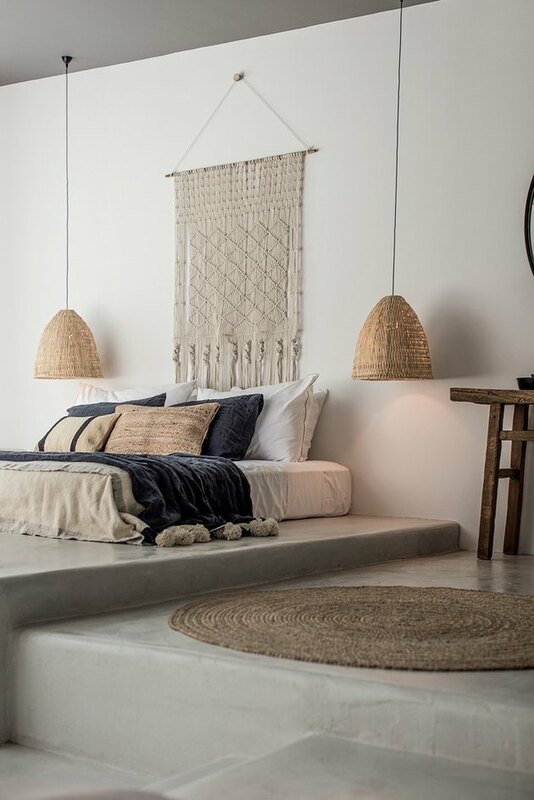 This Rhodes, Greece respite comes together with muted coastal tones, natural elements, and tons of texture. The bell-shaped pendants — coupled with the large-scale macrame wall hanging —break up the minimal white walls and enhance the organic feel. Love the look? Score these woven gems from Serena & Lily. The space: Calm, cool, and stylish. A bohemian, beach-chic retreat designed with a rich, earthy color palette, white shiplap walls, fresh floral bouquet, sumptuous blue area rug, and an eclectic assortment of patterned throw pillows. 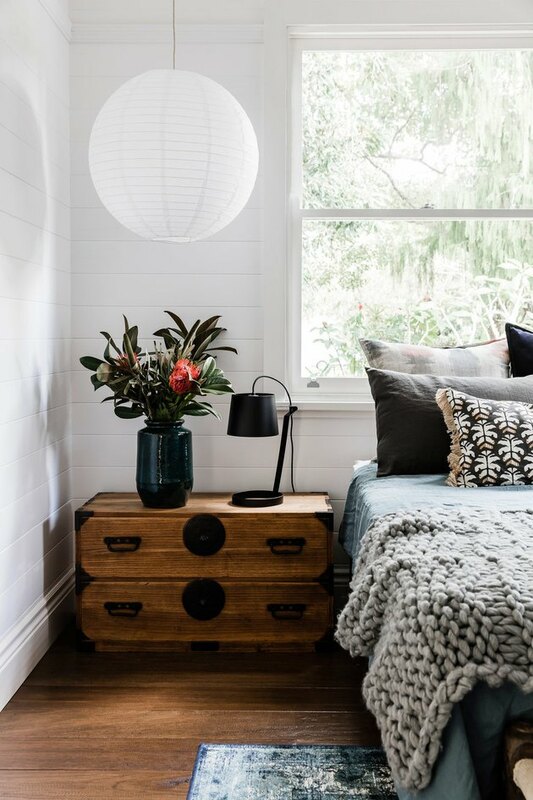 Creating a warm, inviting vibe and adding extra downlight to the beautifully detailed trunk-style nightstands, are round paper lantern pendant lights. 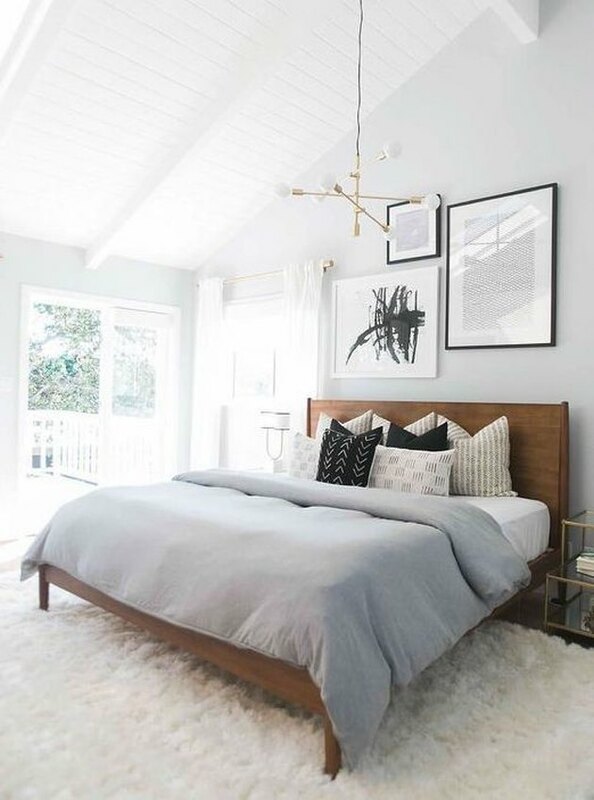 Best described as warm and cozy, this master bedroom redux by DesignLoveFest boasts a soft, cool-toned color palette, chic swing arm wall sconces, plush, comfy pillows, and textured area rugs. Of course, the crown jewel is this darling, handmade bamboo lattice pendant from Ikea. Fans of midcentury design will love this modern brass chandelier by Schoolhouse Electric. 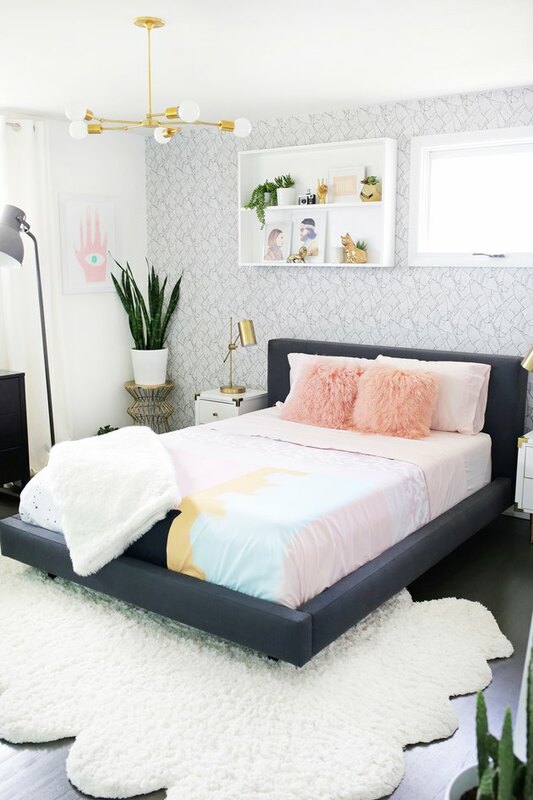 In the case of this 60s-style bedroom belonging to Laura Gummerman of A Beautiful Mess, it was the perfect replacement for an outdated ceiling fan. And we're just tickled pink by the framed high five-style print from Urban Outfitters.